Key Porter and Hockey Night In Canada have not done a great job in releasing information about this upcoming title. It was the same last year with By The Numbers: From 00 To 99. It's pretty obvious what they're planning though. Morrison will write about or perhaps for 50 people about their "greatest day," likely their most famous game. Since this is a HNIC release, you can bet CBC covered the game. 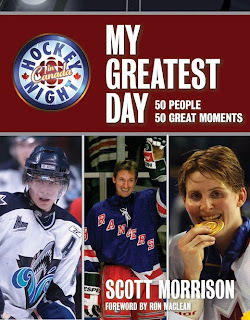 Of course there is no word yet as to who are the 50 people sharing their stories, although the cover image contains Sidney Crosby, Wayne Gretzky and Hayley Wickenheiser. As soon as Key Porter releases their official book description, I will be sure to post it here. Scott Morrison, the recipient of the Hockey Hall of Fameís 2006 Elmer Ferguson Memorial Award, has been covering hockey for 25 years. The Toronto native began his career at the Toronto Sun in 1979. After spending more than 11 years as a hockey writer and columnist at the paper, Morrison became Sports Editor in 1991 and led the section to being named one of North America's top-ten sports sections in 1999 - the first sports section in Canada to receive the AP Sports Editors North American Award. Scott, a former two-term president of the Professional Hockey Writers' Association, joined Rogers Sportsnet in 2001 as Managing Editor, Hockey, and is currently both a commentator on Hockey Night in Canada and a columnist for CBC.ca. This book will almost certainly follow in the template of 2007's HNIC/Morrison release, By The Numbers: From 00 To 99. Which means we count on a high quality finished product featuring great photography and layout, and some good content. This should be a solid book to flip through, and a common book under the 2008 Christmas tree.